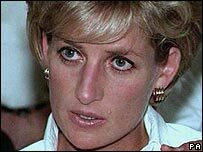 On the eve of the publication of Lord Stevens' police report into the death of Princess Diana, a special programme investigates allegations that she was murdered by the secret service on the orders of the British establishment. Nearly 10 years on from the car crash in Paris, which claimed the lives of Princess Diana, Dodi Al Fayed and their driver Henri Paul, questions remain. How Diana Died: The Conspiracy Files talks to the people behind the conspiracy theories, reveals new evidence and explores the continuing controversy over what really happened. Your views: Will Diana report end conspiracy theories?